Hello again! So I've just returned from my four day holiday in Melbourne! It was amazing, and a great escape from the horrible heat in Brisbane. Even though it is currently summer in Australia, the temperature in Melbourne is about the same temperature of Brisbane's winter. Winter being my favourite time of the year, I was pretty damn thrilled. So to demonstrate my new found love for Melbourne, here's some photos I captured on my Canon 600D. This one, above, is a shot from one of the many arcades we went through. The Christmas decorations were still up, and so it was super pretty and the atmosphere was super great. One of the awesome things about Melbourne, is that everyone seemed super happy! Even getting served by teenagers in retail stores, they seemed legitimately happy to be there, serving you! This photo above is seriously just to show how gorgeous the architecture of Melbourne is. The shops in the city are integrated into these super old buildings, and mostly the buildings are unchanged. Going through the more suburban areas of Melbourne, there are plenty of terraces, all old fashioned and untouched. I'm now of course hoping that one day I'll move down to Melbourne and live in a really nice terrace house. Also one of the amazing aspects of Melbourne are their lane ways. When walking around Melbourne, take time to look down the lane ways. Many of them are covered in colourful graffiti, which make the lane ways seem more happier and brighter than if it was left bare. These lane ways usually had people walking through them, looking at the graffiti, and I really wish we had more lane ways like them in Brisbane. 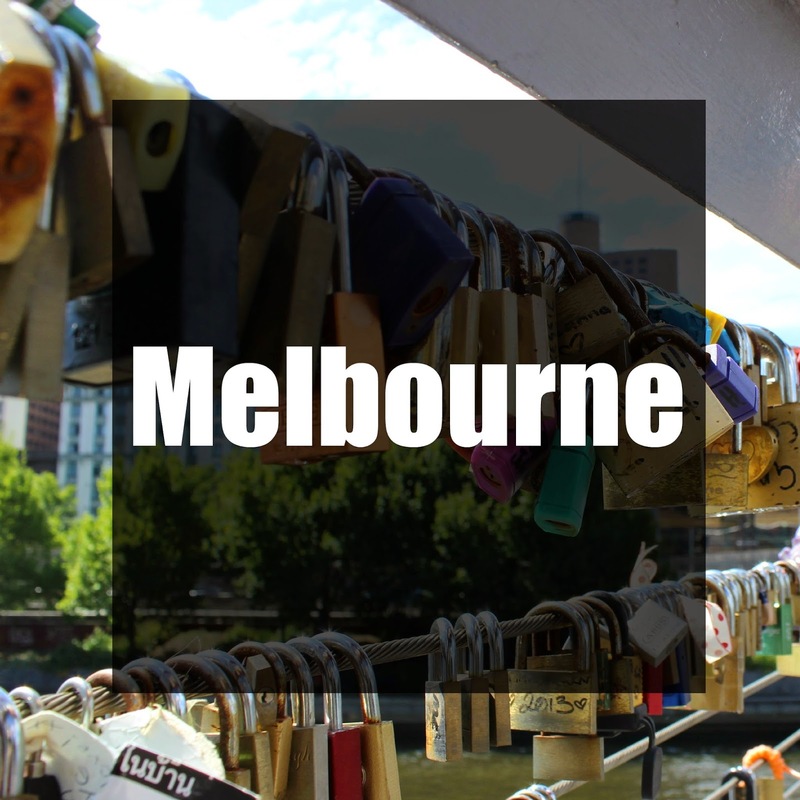 Melbourne and Brisbane are such different places, and of course if I had to choose which city I would choose, of course I'd choose Melbourne! The Jean Paul Gaultier exhibition was on while I was down in Melbourne, so naturally I went down and saw it. As weird as the creations were, I really loved all of the pieces, including the mannequins with moving faces projected on to them. If anyone has the chance to see the exhibition, I'd definitely say you must go! It's an eye opener, and just please don't take children in to the exhibition because some of the clothes in the exhibition are a little racy and I don't exactly want the newest generation to be mentally scarred. Okay, so when people go overseas, some of them go 'oh I went to the bridge in France (or Germany) with all the locks with couples names on it, I'm so cool and it was so romantic blah blah blah', you can laugh in their face and tell them they wasted their money going overseas to see that bridge because in Melbourne, there's a bridge with locks, just like the ones overseas. You're welcome, and now you can call yourself a savvy traveller. Also it's good for cute photographs. Another thing I loved about Melbourne was the food. The food there is exceptionally cheap, yet fresh and you get a lot of it. So if you're looking for good food and yet don't have a lot of money, go to Melbourne because I'm still getting over the fact that I paid less than $7 for a breakfast that could easily fill the guts of two hungry people. It's awesome. And the cake shops in some of the arcades and St Kilda are a huge must, even if you don't buy anything, just seeing the huge amount of sugar in the windows is pretty damn awesome. Looking for a super chocolatey sugar hit? Go to any Lindt Chocolate Cafe and order their hot chocolate because all it is is melted Lindt chocolate with super creamy milk. I think I gave the customer next to me a headache because with each sip I took, I said a little 'yummmmm'. Sorry random person, but you do not understand the fact that this is my first time. Do not judge me. The photo above is from St Kilda, while walking on the pier. It was super windy, naturally, and that day it was fairly overcast. It rained while I was half way across the pier, and even the raindrops were big. Just about everything in Melbourne is big, and I just love it. I would 100% move to this city in a heart beat. On one of the days in Melbourne I ventured into their China Town. I don't know what I was expecting, but I was definitely let down. I thought there would be lots of cute little Chinese stores, but there really were only restaurants of which many were closed or looked really dodgy. So, yes, Brisbane wins in the China Town aspect. Finally in conclusion, Melbourne is now my most favourite place in the world, and if I hear anyone say 'I'm going to Melbourne', I'm going to of course ask them and beg them for myself to come with them. I love Melbourne so so so much and after I finish university, I'm so moving down there. Maybe I can work in a hospital and have a super cool house just like Nina Proudman (my most favourite character of all time) does. My dream.